Read an article about San Francisco lately and it’s almost guaranteed to be bleak. Sky-high rents. Software moguls pushing out local artists. Throngs of Californians fleeing north for Washington’s evergreen pastures. But at the top of Nob Hill, a ray of hope for performance artists and festival event organizers poked through that ubiquitous mist—the San Francisco Movement Arts Festival (SFMAF): A Walk About in Grace. 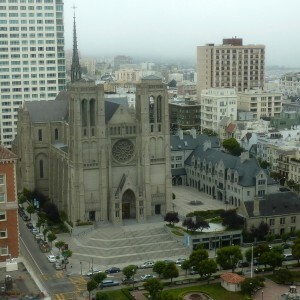 Jim Tobin, Founder of Bay Area Dance Watch helped create a “farmer’s market” of short dance, theater and music performances in the landmark Grace Cathedral. The enormous space, including the main church, downstairs conference center, gym, hallways and three chapels was transformed into a stage. Guests walked around at leisure to experience the 19 stations of movement. A few stations had music, some featured chants and there was a full movement choir. Tobin’s fierce commitment to local artists and community are values Brown Paper Tickets shares. Like us, Tobin believes in giving more and taking less. All performers were local with the exception of a couple guest artists. And proceeds would be divided among performers. The event sold out one week before the big night. Our outreach team supported Tobin’s efforts early on—advising him on how to set up his event page, price tickets and market the event online. “We knew Brown Paper Tickets would take care of all the technical issues and the sales of the tickets, so we could concentrate on the event itself and the performances,” he wrote in a thank you letter to us. Tobin reports (with a chuckle) that the first and most daunting challenge was just sitting down to draw up the event. It was an incredible feat to pull off with 12 dance companies and more than 100 performers. With the number of performers, time constraints and limited access to the space made, rehearsal presented another obstacle. Every station had a designated leader and every station leader had to meet Tobin once. “That worked well,” he says. Short tours of the cathedral were given to artists, most who were used to performing in smaller venues, like lofts. Such a large gathering of artists had an unanticipated side effect: it acted as a catalyst for community, bringing together local dancers who may have never met otherwise. The festival capped off with a dance down the middle of the Cathedral and a dessert reception and “performance antics” in the basement. Welcome to this week’s Artist Ticket Picks. The Artist Ticket program gives our customers a way to donate to causes that we care about. If you’re a ticket buyer, check to see if the limited edition ticket is available at the beginning of the ticket check-out process or by visiting the Artist Ticket page. You receive a small piece of collectible art and support a valuable cause just by checking the box in the Artist Ticket widget when you’re purchasing your tickets. Led by its creator, the charismatic singer, songwriter, dumpster diver and one-time gravedigger Giovanni DiMorente, EL Radio Fantastique is a collection of talented and electrifying musician-performers from the small farming community of Point Reyes Station, California. The overarching musical influences for the group derive from DiMorente’s coveted record collection scavenged from abandoned tenements in New Orleans and a lifetime of dumpsters. EL Radio Fantastique comprises a unique menagerie of sights, sounds and musical styles. Indeed, the vibration emitted from this group defies all genres as much as an archaic knob would turn on an antique radio. EL Radio Fantastique is known to put on bewitching and alluring shows with steamy theatricality. Consistent with DiMorente”s folklore, witnesses have remarked that the band’s players appear to be charmed and somewhat possessed, inspiring a visceral and enchanted concert experience. Tags: burlesque, music, performance, roller derby.